Having posted out a vacancy advert to a selection of your job board and social sources, you may wish re repost the advert again in the future. This might be because the advert had expired, or you just wish to post the same advert to a different board or source. In this article we'll show you how to repost your existing adverts from your CRM, including making any edits to improve your response. 1. Open idibu inside the relevant CRM vacancy, and click the 'Adverts' icon. 2. This takes you through to the adverts page where you will see a list of all adverts posted to date against this vacancy. 3. 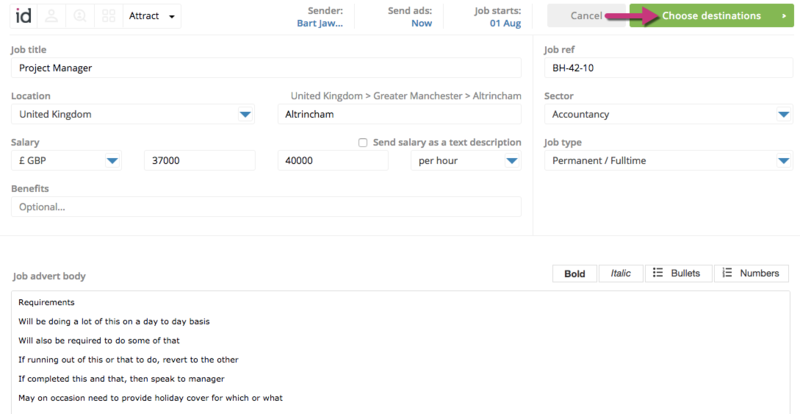 To repost an advert to the same job board/social sources without making any edits or changing the destinations, simply hover over the advert and a grey tick inside a circle will appear to the left. 4. Click this icon and it will turn blue, then click 'Quick repost selected' (or 'Quick repost expired') on the advert in question. 5. To edit your advert to improve your candidate response, or to change your posting destinations, follow the same process, only this time click 'Repost selected'. 6. This opens up the original advert page and allows you to make edits to your advert. When you are happy with your changes, click 'Choose destinations' to select the boards and social sources you wish to post to. 8. You can now select your posting destinations and complete the posting process as normal. Want to refresh your memory on posting to multiple destinations?